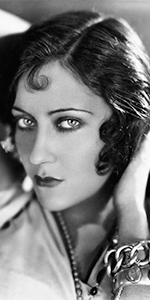 Gloria Swanson perhaps defines our modern notion of what it was to be a silent movie star. With her flashing eyes and distinctive look, Swanson was a very popular figure in the silent world. She achieved immortality, however, by playing a silent film star in the classic Sunset Boulevard in 1950. Born of a Swedish father and a German, French and Polish mother, Gloria moved around as a child, for her father was in the Army. She spent a good deal of time in Puerto Rico and Key West. While in Chicago again in 1914, an aunt took her to visit the Essanay studio, where they asked her to do some extra work. She appeared as a stenographer in Charlie Chaplin's short His New Job (releaased in February, 1914). 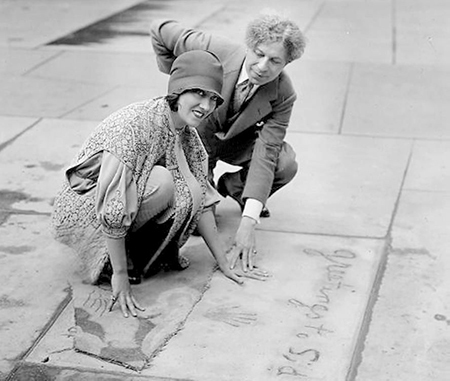 After her parents separated, Gloria and her mother moved to California, making comedy shorts at Keystone studios with Bobby Vernon in 1916-1919. After signing a deal to appear in films for Paramount, she bagan working with director Cecil B. DeMille, who fashioned her into a romantic lead actress. The titles give you some idea: Don't Change Your Husband, (relesased in January, 1919), and Male and Female (released in November, 1919), Why Change Your Wife? (released in September, 1920), and The Affairs of Anatol (released in September, 1921). The working relationship with DeMille did not last, however. She worked with many other directors and actors, continuing to be a huge draw all over the world. Paramount, anxious to keep her from jumping to another studio, pampered her shamelessly. Her films became lavish costume dramas, where the clothes she wore often became more important than the scenario. While shooting the film Madame Sane-Gene (released in April,1925, in France, she married a French Marquis (who was her on-set translator). Gloria had become a Marquise. They would divorce in 1930. After Madame, Swanson only made two features per year — a considerable slacking. Despite Paramount's coddling of its star, in 1927 Swanson decided to produce her own films for release through United Artists. Now completely in charge, her first film, The Love of Sonya (released in March, 1927), went over budget and performed poorly. She then selected to appear in a film of Sadie Thompson, which went over budget, but became a hit. Teaming up with film production dabbler Joseph P. Kennedy, Swanson undertook Queen Kelly in 1929. The silent picture would be directed by Erich von Stroheim, and would become such a debacle that it was only released in Europe. Trying to recover, Swanson made several sound films for UA. The Trespasser (released in November, 1930) was a hit, others weren't. She gradually left the pictures to work in the theatre and, in 1948, she hosted The Gloria Swanson Hour, an interview show, broadcast live on New York's WPIX-TV. Doing the show was extremely taxing for her. Then came the offer to portray Norma Desmond in Sunset Boulevard (released in August, 1950). At first, she was reluctant to play the has-been / delusional silent star, but director George Cukor advised her to do it: "It's the role you will be remembered for." She did the film, and created what is probably the most riveting performance ever filmed. A big hit too, and an indestructable classic. After Sunset Boulevard, Swanson appeared on a good number of television programs, and toured in Broadway shows. Her autobiography, Swanson on Swanson was published in 1980. She passed away in New York City in 1983, at the age of 84. Grauman's Chinese Theatre, Hollywood, California. Gloria Swanson and Sid Grauman. Date unknown. 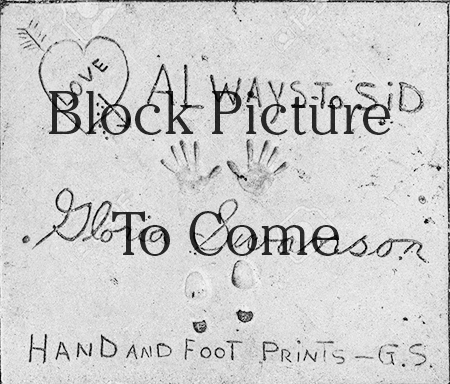 They are comparing Swanson's hand size with the hand imprint on Mary Pickford's block.